In Full-Body Fitness for Runners, running coach and personal trainer Thad McLaurin shows how to incorporate upper-body, lower-body, and core exercises into your weekly running and fitness routine. Without the need for expensive equipment or lots of time you’ll be running longer, stronger, faster, and healthier no matter what your age. 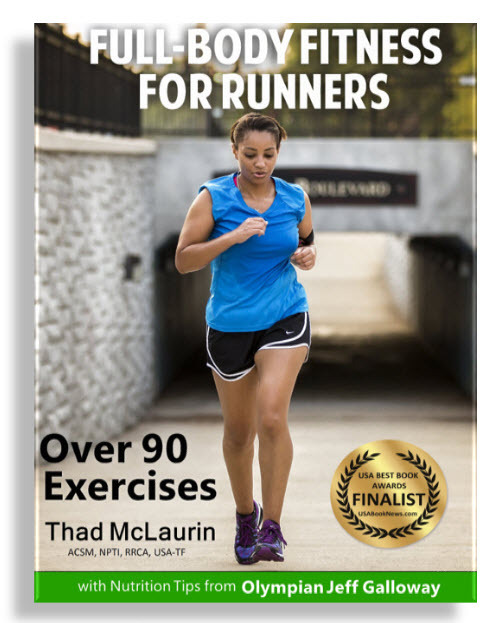 Providing over 90 exercises for runners, nutrition tips from Olympian Jeff Galloway, fueling recipes from experts such as endurance runner Dean Karnazes and ChiRunning founder Danny Dreyer, good running form tips, and more, Full-Body Fitness for Runners is a must-have resource for every runner. Three levels of workouts (Novice, Intermediate, Advanced) are divided into lower-body/core and upper-body/core circuits. Each circuit consists of 12 exercises designed to build muscular endurance to support your running. Whether new to running or a seasoned runner, Full-Body Fitness for Runners will make you a stronger runner providing for years of healthy running.